Sometimes you cannot receive your PTCL bill in time. If you don't pay it within due date, you have to pay extra money as surcharge next month. And if you pay it after due date it is shown as arrears in next month’s bill and then there is trouble of correcting it. 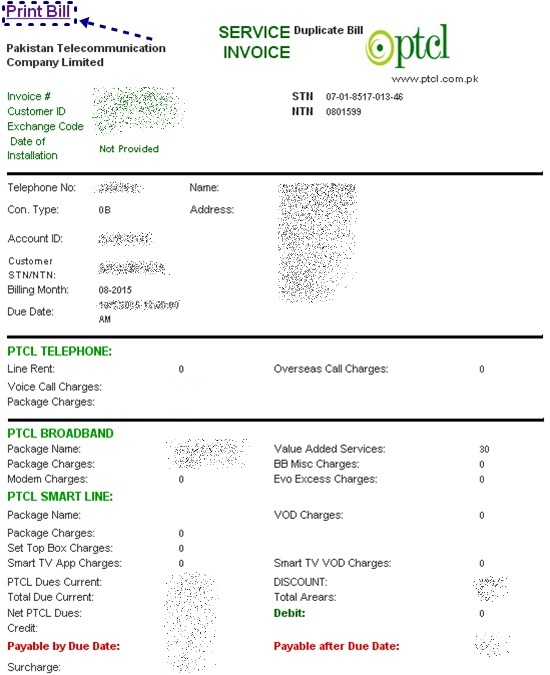 So here we are going to tell you that how simply you can see, download and print your PTCL bill online. Just make a print and submit your dues on that. There is no need to submit any application or visit PTCL exchange or office for duplicate bill. 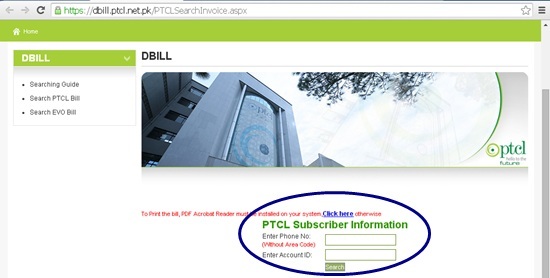 Now you can check PTCL telephone Bill online free just by entering your phone number and account ID. PTCL (Pakistan telecommunication Company limited) now provides facility to check and download your PTCL Broadband or EVO bills online free of cost. How to Check, Download and Print PTCL Bills Online? 2. Enter your Phone Number and Account ID and click on Search button. Account ID can be find on the top of any previous month's bill. Your bill shall be shown. If your want to save or download it there is an option of Print at the top left corner. Click on it and save the page that opens. You can pay the bill on the printed copy. 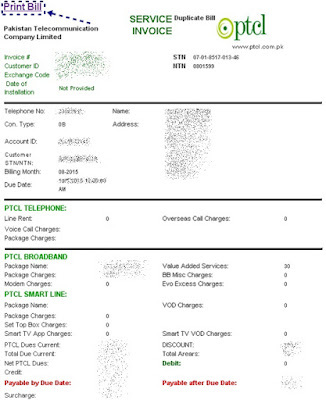 PTCL also send soft copy of bill through email. If you have not given a valid email at the time of filling connection application, you can call helpline 1218 to register your email. Once you register your email, you will get your monthly bill in your email account regularly well before the due date. It is always a good idea to keep record of bills. So, you can download your bill for each month and keep its soft copy as a record in your computer.